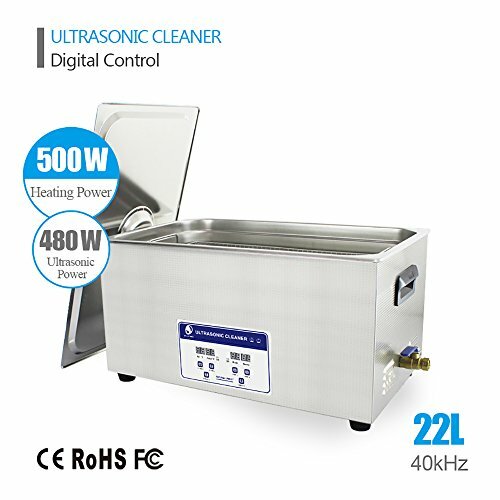 Ebelt Industrial Professional Ultrasonic Cleaner cleaning system works to remove dirt, dust, and grime from your valuable items in minutes without damaging them, make them more cleaning and beautiful. 480W power with frequency 40kHz cycle ultrasonic energy wave creates millions of microscopic cleansing bubbles that attack and remove most stubborn blemishes for a powerful yet gentle clean. 0-30 minutes cleaning cycle with auto power-off makes operation simplely ""zizizizi"" noise is normal. 500W heating power working effects better than normal. Convenient bottom drainage, avoid movement, Professional cleaning results every time make products cleaner great for small commercial business or home use. •Online Store strive to offer our customers the best online experience possible. We has developed long-term partnerships with our manufacturers world-wide. As a result, We are able to purchase large volumes of top quality products for highly competitive prices. •We offers an extensive range of products selected by our professionals. qualified by authorized organizations to ensure products are of the highest quality. •As an internet seller, Has built a complete logistic system, offering the most convenient delivery service possible. •Stainless steel tank, high resistance to wear and long work-life,Digital timing and heating control, super easy to operate. If you have any questions about this product by eBelt Industrial, contact us by completing and submitting the form below. If you are looking for a specif part number, please include it with your message.